Hunger pangs + broke + midnight = We have an emergency! 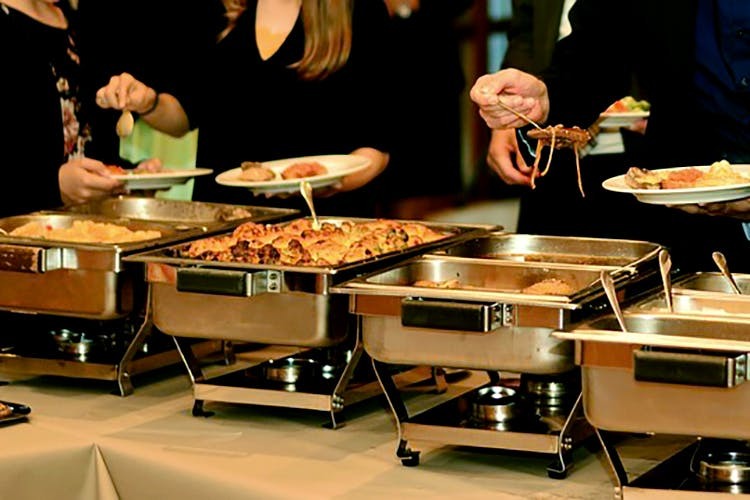 Don’t go for those mundane packaged noodles or snacks when you can eat a buffet at Time After Time till 4 am. Located at The Central Park Hotel, Near Inox, Bund Garden Road, Time After Time is your saviour when you’re broke and hungry during the wee hours of the night. Their midnight buffet, from Tuesday to Sunday, between 11.30 pm and 4.00 am, is what we highly recommend. The great dinner spread includes everything from cream soups to chicken chowder, a veggy-green Greek salad and more. There’s an assortment of starters for both veg and non-veg eaters. A beautfully made mushroom fritters in cheese sauce and a farfalle with shrimp saffron sauce will do wonders for your appetite. For the main course, don’t forget to try their stir fried vegetables in green curry and the shredded chicken in black bean sauce. End this meal with either a Nizami shahi tukda or a black forest sundae. Do a favour to your midnight cravings and head to Time After Time with the squad.